Last year I had the opportunity to do a small excavation at the site of Chau Srei Vibol. Although the excavation wasn’t very productive, I enjoyed spending several days at this beautiful and quiet site that doesn’t see many tourists. The ancient ruin of Chau Srei Vibol sits next to a modern wat. 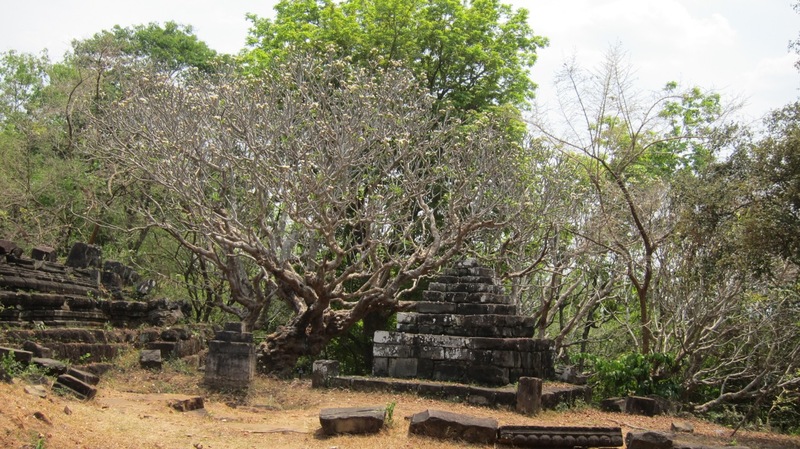 Chau Srei Vibol sits about 17 km directly east of Angkor Wat and was built in the 11th century. It is surrounded by a huge moat (about 1450 meters east-west and 970 meters north-south). Inside the moat is another laterite wall. The temple is located on top of a small hill that requires some light climbing. 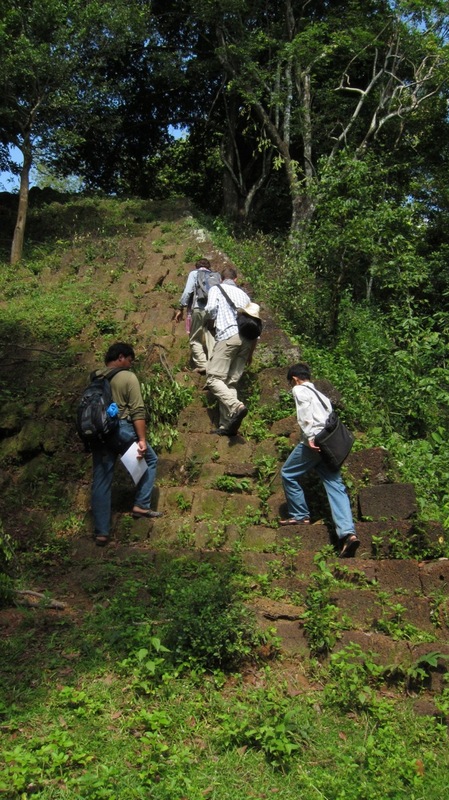 Climbing up to see Chau Srei Vibol. 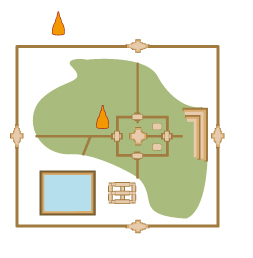 Also on top of the hill and directly next to the Angkorian ruins is a modern Wat. When we visited it was quiet and we didn’t see many people around. Since the temple is fairly collapsed you can do some climbing around to check out the picturesque ruins. A lovely champei tree at Chau Srei Vibol. 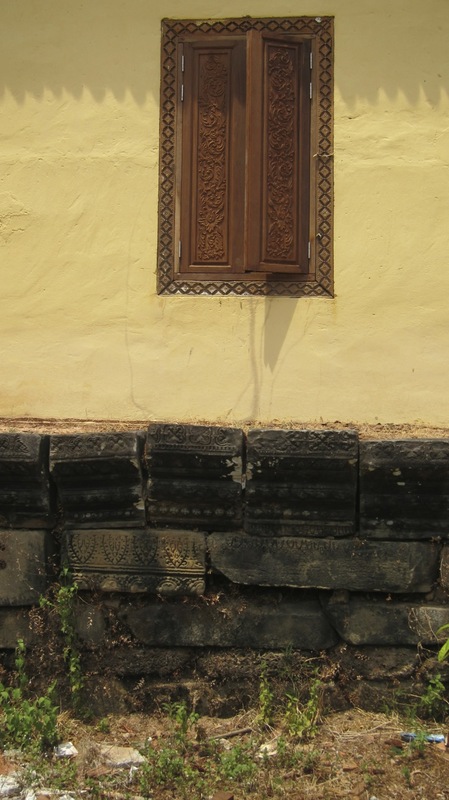 The modern Wat has reused some of the Angkorian stones as part of their foundation. 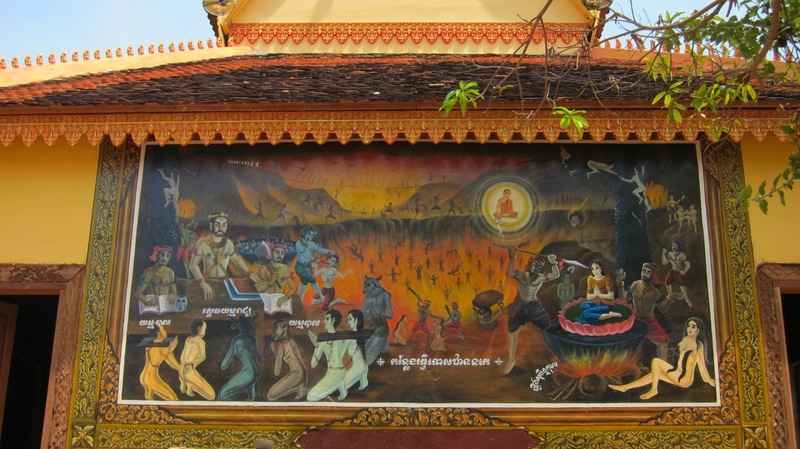 This painting on the outside of the modern Wat depicts scenes from Buddhist hell. The eastern portion of the site is still heavily forested, and when I visited last year (2012) it was still mined. Stay on the marked paths and away from the “Danger: Mines” signs and you’ll be fine. 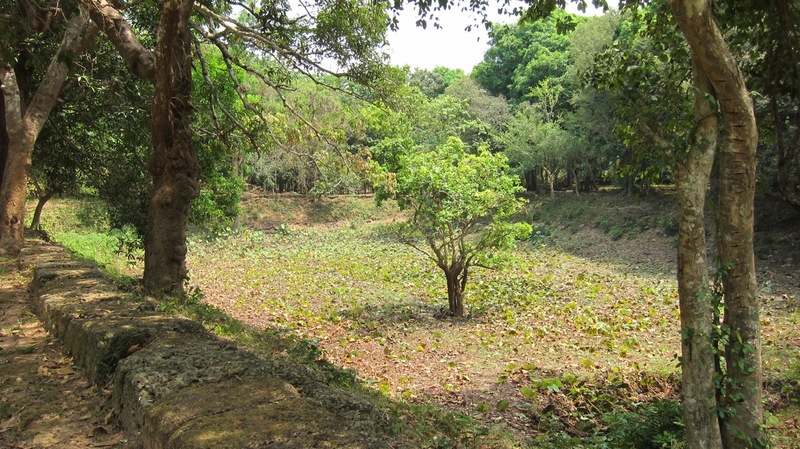 The upper part of the hill with the ruins and modern Wat are safe to walk around, as is the cleared area on the western half that includes the water reservoir. There has been little scholarly work done on Chau Srei Vibol. It seems to be located in an area that may have been modified as part of the early water management network. A recent dissertation that employed Ground Penetrating Radar (GPR) showed evidence for some destroyed structures inside the enclosure. Our excavations were looking for evidence of post-Angkorian habitation inside the enclosure, but we found little evidence in our small excavation units. Overall, Chau Srei Vibol is a nice trip outside the main Angkor park. Pack a lunch and enjoy the park-like surroundings free from hoards of tourists. The (dry) water reservoir at the base of the hill. 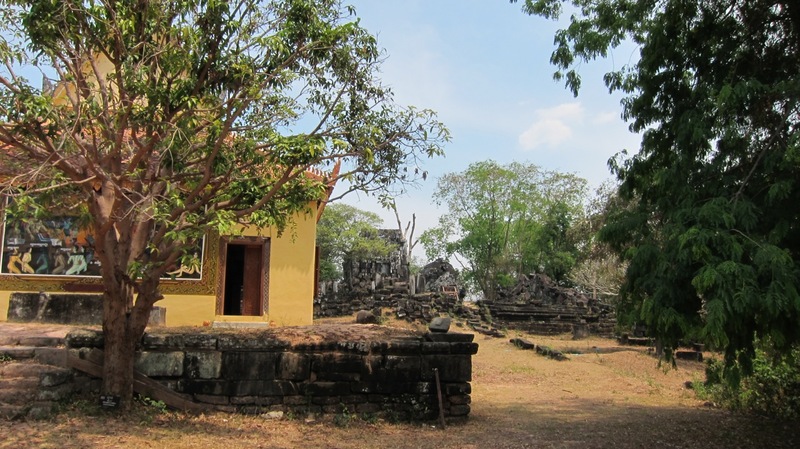 This entry was posted in Archaeology, Off the Beaten Path at Angkor, Travels around Cambodia. Bookmark the permalink. Chau Srei Vibol seems like a nice place to stop by for those that that want some solitude when visiting historically rich destinations. 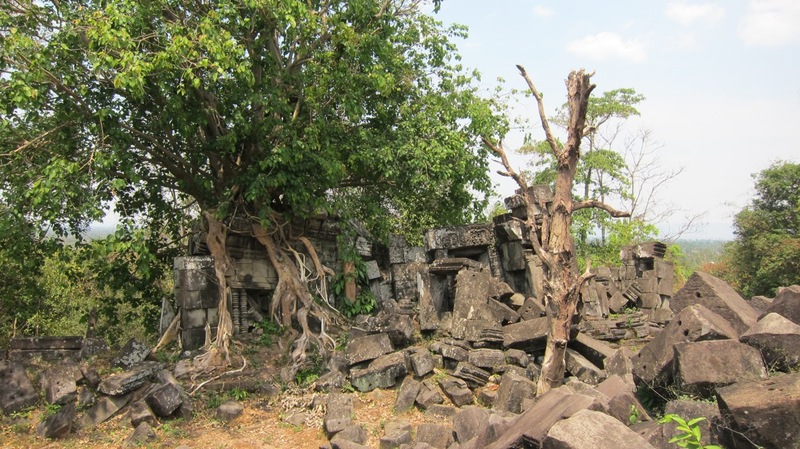 Next time I go on a return trip to Angkor Wat, I might visit these ruins. Thanks for sharing the photos. I didn’t know about the mines… I almost bombed down that hill, but was a bit light headed from having skipped breakafast and the heat… if you climb to the top of the tallest temple on the hill, you are rewarded with views to the SW, W, and N… There was also a structure that looked to have been a crematorium made out of the old stones for the new wat on the hill.. under the tree you have photographed…There is a weather station just to the west of the walls too… cool spot..not even a guard.. just the guys at the wat next door to the north at the bottom of the hill who can watch your scooter.. This is one of my favorite spots. It’s clear that it was a very important site in its day. Too bad so little is known about its history. The moats are truly enormous. Seeing them in a satellite image was what first got me interested in going. I also liked the co-existence of old and modern, what with the contemporary wat at the top of the hill and the school just outside the wall.